“Healthcare” has been a major buzzword this summer. In the U.S. certainly, the debate over healthcare – what care should and should not be covered by public funding – has dominated the news cycle. Paying for healthcare is also a large topic of discussion in Israel. Despite the establishment of universal healthcare in Israel in 1995, private spending on medical services has been increasing faster than public spending in recent years, thus increasing the private share of total healthcare finance. This has contributed to disparities in access to care that can increase inequalities in health between the rich and the poor and between the “center” and “periphery” of the country. 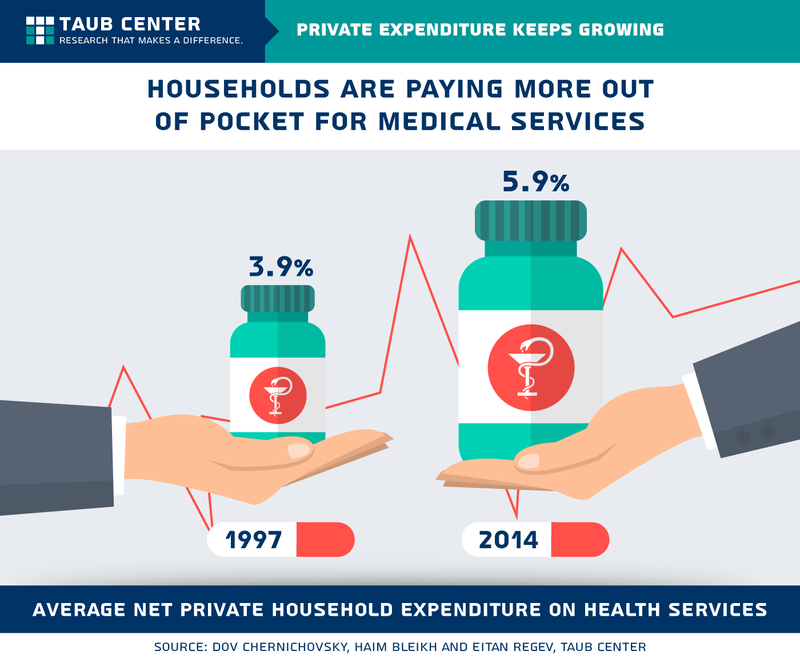 In their study published in the State of the Nation 2016, Taub Center Researchers Prof. Dov Chernichovsky, Haim Bleikh, and Eitan Regev found that private spending on healthcare has increased since the late 1990s. In 2014, private household spending on healthcare was about NIS 906 per month, on average, or about 5.9% of the average household expenditure, as compared with 3.9% in 1997. Public spending per person rose from NIS 4,819 in 1995 (in 2014 prices) to NIS 6,377 in 2014, with an average annual growth rate of about 1.5%. In contrast, private expenditures rose during the same period from a total of NIS 2,247 (in 2014 prices) to NIS 3,634 – an average annual growth rate of 2.6%. In other words, the growth in private spending was far greater than the growth in public spending. Private spending on medical services varies with income. 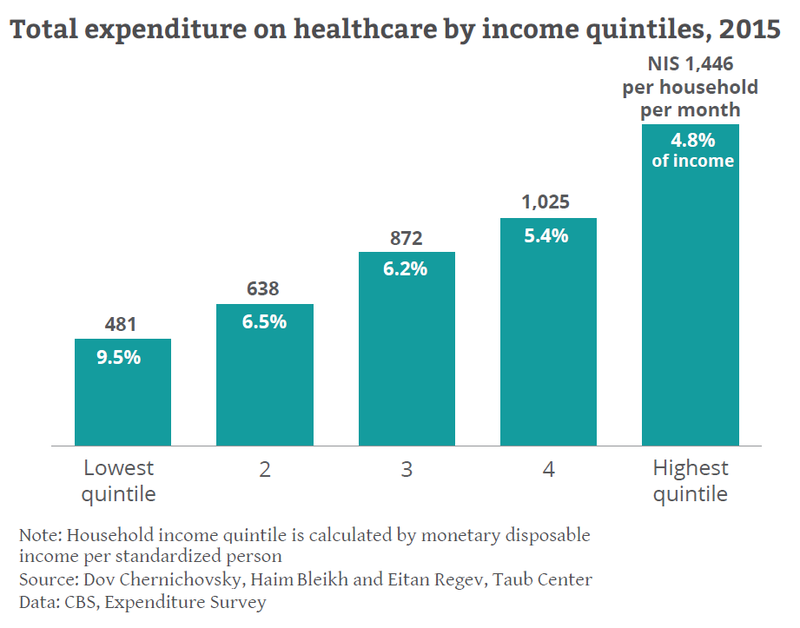 When we look at spending at the household level, rather than per individual, the highest-income households (top quintile) spend nearly three times more than the lowest-income households (bottom quintile) on health – NIS 17,352 per year as compared with NIS 5,772 per year, on average. And, those with the lowest incomes spend a larger portion of their income on health services than those with the highest incomes. In 2015, the lowest-income households spent an average of 9.5% of their disposable income on medical care, compared to 4.8% in the highest-income households. Thus, not only do low income households have less access to medical care, they also shoulder a higher burden for this care, at the expense of buying other goods or services. This private spending can be broken down into two major categories: insurance premiums and out-of-pocket payments. Over a fairly short period of time, the percentage of Israelis who purchase their health fund’s supplemental (private) insurance grew from 50% to 80%, with only the poorest not allowing themselves this expenditure. Supplemental insurance is provided by the four health funds for care not included in the universal basket and is considered semi-public because they must accept all applicants, cannot rate them based on their health, and premiums vary only by age. Commercial insurance is less common than the health fund supplementary insurance, although more than 40% of the population purchases it. Some of these private expenditures are superfluous; Israelis often pay privately for services already included in public entitlements. Unsurprisingly, private spending on supplementary care, parallel services (private services for care that is also available through the publicly funded health basket), and commercial health insurance increases as income increases. However, the fact that such a large – and growing – portion of the population with higher incomes purchases supplementary care supports the hypothesis that the public system is insufficient from their perspective, either in the type or quality of care provided. Private insurance does indeed provide some meaningful benefits to those who purchase it, including significantly shorter waiting times for medical treatments (which are often long in the national health fund system), meaning that wealthier citizens are able not only to choose their doctor, but also to have medical procedures carried out in a far more timely fashion. However, on a societal level, its prevalence also increases gaps in the area of waiting times. The combination of increasing private expenditure and the fact that private and public healthcare in Israel are supplied by the same providers, incentivizes the providers to prolong waiting times in publicly funded care in order to push patients into private care, which provides extra benefits to the providers. Another important finding of the study is that private spending on supplementary care that is not included in the universal health basket (mainly dental care) and for parallel services is higher in places where public services are less available – namely, among Arab Israelis and also to some extent among Haredim (ultra-Orthodox). In general, the National Health Insurance law is structured to give everyone equal access to a basket of basic healthcare services independent of how much each individual spends privately on health. However, the increased role of private spending in Israel’s health system confounds the notion of equal access to some extent, and the weaker population groups end up spending a greater portion of their income on private health expenditures than do those who are better off. This outcome does not seem to fully align with what the law was intended to accomplish.